Lighting candles in this season of advent is something I always look forward to. Today is the first advent and one candle is lighted everywhere. Advent marks the preparation for the birth of the Holy Child in the Christian community. 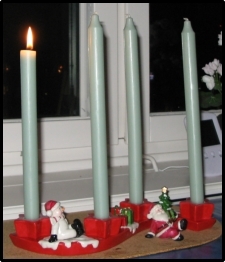 The four candles represent the four Sundays before Christmas. This means the countdown to Christmas Day starts today. This electric candlestick adds color to every window of the house. I put up four of these by the windows in the kitchen and in the livingroom. I could have placed one in our workroom, too, but some bulbs are not working. 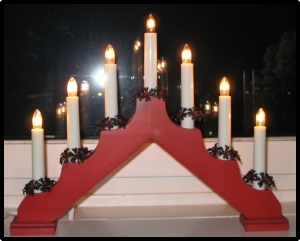 In dark, winter nights, this electric candlestick looks fantastic in the rows of windows. It’s another symbol that Christmas is in the air. here. I’m happy to “meet” you! Thanks, Catherine. Yours is an inspiring thought about Advent. It’s worth the wait, really. Happy to meet you too. Ambo, advance Merry Christmas din, hehe! buti pa kayo dyan kabayan, nagre-ready na for xmas. dito sa tin malungkot ang pasko dahil nagtitipid ang lahat ng tao. Kahit na mahirap sa atin kabayan ay masaya rin talaga pagsapit ng pasko, hehe….miss ko na nga pasko diyan eh., huhu!